The HMHB team celebrate the last baby follow-up in the study! Memorable day – mammoth effort – major milestone achieved! Four years on since our research team first started recruiting pregnant mothers for the first study of our landmark Healthy Mothers, Healthy Babies (HMHB) project in Papua New Guinea (PNG), the final follow-up check has been celebrated in Kokopo, East New Britain. After more than 2290 maternal health checks, 1500 baby checks, and immense dedication by our field team to complete the data collection in a very challenging setting, achieving the end of field work on the HMHB Mother Baby Follow-up Study is a huge milestone in women’s and children’s health research in East New Britain. Head of the Healthy Mothers, Healthy Babies project, Professor James Beeson praised the Kokopo-based team and the Melbourne researchers. “Completing the final follow-up in Study 1 is a fantastic achievement. This is the completion of a project that started with the first enrolment in early 2015, and has been hugely complex and challenging involving so many of our team in the field, clinics, laboratory, office, and out on the roads,” he said. Image: HMHB field team conducting last check-up with a mum. (L-R) Ms Primrose Homiehombo, Dr Chris Morgan, Ms Rose Suruka and Ms Pele Melepia. HMHB Principal Investigator, Dr Chris Morgan was in Kokopo, East New Britain this week to witness the final follow-up check with a mum and baby. He described the achievement as ‘momentous’. “This final check completed four years of immense dedication by our HMHB field team. This also shows that a complex, demanding study of this type is feasible in PNG, with the right level of commitment; following research participants for such a long period is no easy task, which is why it is so rarely done,” Dr Morgan said. “The setting for our team’s work with the final mother and baby in the study was typical: under a canopy of palms and trees on the edge of dense bush, a portable table provided a sterile work area for specimen collection and rapid diagnostics, a woven mat on the grass a private interview area, another folding table the space for weight and length measures. The mother and father get immediate feedback on the state of her and her baby’s health; aiming to build a healthier family right now, as well as the invaluable contribution their data make to the overall research study. 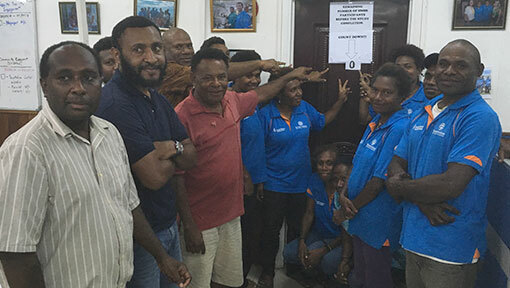 “The investigator team could not be more grateful to those partners in PNG and Australia who have helped make this happen, and right now our biggest congratulations are to our amazing field team; the research officers and drivers who travelled far and wide across the province, the laboratory team who safely tested and transferred thousands of precious samples, the data management team who kept records secure and intact, the back office management in Kokopo and Melbourne who enabled it all to happen. “Early results from this study have already supported new interventions to improve malaria diagnosis and postnatal care. 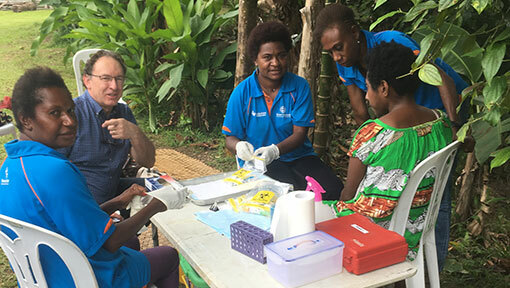 Early findings have also brought new understanding of the burden of ill health borne by PNG mothers and babies, including some infections not previously described in PNG. Image: Big day in Kokopo, PNG with the final baby check in the follow-up study. Key HMHB research investigator, Dr Michelle Scoullar also shared her congratulations with the team. “Its very exciting times for the HMHB project having seen our final mum and baby! Four years of incredible effort by our PNG team towards saving newborn and maternal lives,” she said. Find out more about HMHB and how you can support our research efforts.